It’s that time of year when every other parcel that drops through your door is emblazoned with the cheekily-grinning Amazon logo. The ‘everything store’ is clearly still at the heart of many consumers’ holiday shopping plans and, consequently, their stock continues to rise at rocket-like speeds. According to analyst firm Pacific Crest Securities, the rise of the retail giant – and indeed ecommerce itself – looks set to continue with experts predicting that ecommerce will likely make up 20% of the total retail industry within the next five years. Retail isn’t the only area in which Amazon (AMZN) is heading for the stratosphere, though. Although Jeff Bezos’ company doesn’t break out its cloud revenue figures, the web services division of Amazon achieved $5 billion in revenue in 2014, finally proving that they’re not just about iPhone cases and cheap laptops. Amazon has an impressive history of growth. In fact, once it had hit the $1 billion mark, it continued to grow faster from that point than Microsoft, Oracle and Salesforce.com. The only firm to beat them was – you guessed it – Google. Pacific Crest now estimate Amazon’s individual share price at $800, an increase of 20% from current prices. CEO and founder Bezos is himself enjoying a similar rise to meteoric valuation with his net worth now estimated at something approaching $35 billion. That perhaps explains why he now shuns talk of retail, instead spending most of his time tweeting about his latest endeavour, the Blue Origin private spaceflight firm (and what he’d like to do to presidential candidate Donald Trump). The majority of Bezos’ wealth is held in Amazon shares, the value of which for many years was questionable; the retailer had, after all, endured year-after-year of sizeable losses. However, their shares have now increased by more than 100% following two consecutive quarters of new income. The tides are clearly turning and both Bezos’ and his company’s wealth is looking far more assured. Although Amazon’s cloud computing division is performing as strongly as ever, ecommerce is where Amazon still scores big time. Pacific Crest’s analysts note that online shopping is expected to grow to total sales of 30% in the next five years – an increase of 7%. You need only look to this year’s stellar Black Friday event, during which Amazon enjoyed a humungous 36% of all online shopping spending. Compare that to Best Buy’s 8.23% and Walmart’s 3.35%, and it is clear that Jeff and co. dominated the US’ busiest of shopping days. If Black Friday continues it’s foray into other markets (the UK, for example, have taken to the super sales day with gusto), Amazon’s cross-continent penetration will benefit the company’s stock price even further. But let’s get back to that estimated $800 share price. Is it fair? Or is it in fact undervaluing a company which simply isn’t ‘just’ an online retailer any more? Indeed, the most-visible part of their business accounts for 90% of their top line, but investors are more interested in the bottom line and Amazon’s Web Services division is the one to watch. It isn’t consumer-facing, but it is a powerhouse in the land of cloud computing and is responsible for much of their recent ascent into profitability. Does that make them a cloud hosting business rather than a retailer? Certainly, looking in from the outside, it seems not, but the figures tell a different story. 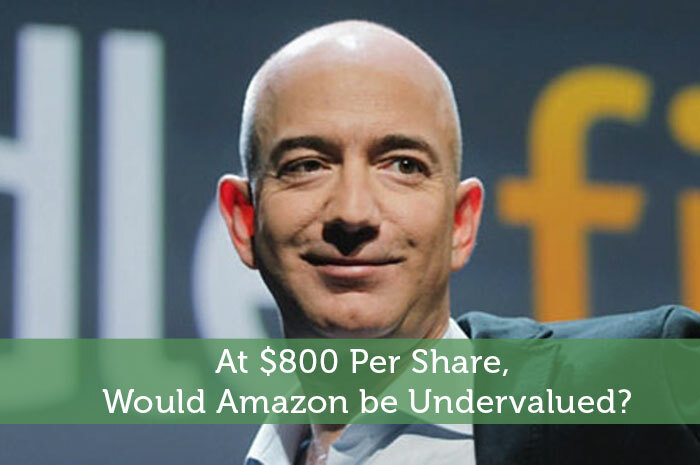 At $800 Per Share, Would Amazon be Undervalued? Mark Ellis is a writer and the owner of Business Fiction, a copywriting service for businesses of all sizes. Mark’s considerable experience at director level and deep interest in personal and business finance means he’s ready to comment on anything from economics to investment.